In the world of competitive videogaming, speed is everything. So Iron Will Technologies, a gaming hardware maker, decided to bring in some pros to show off its one-of-a-kind input device, the Peregrine. The device is similar to a glove control device currently under development for the military, according to Iron Will CEO Brent Baier. 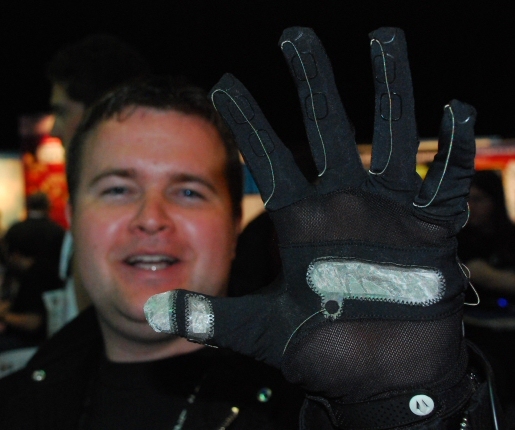 The left-hand glove is made of thin, stretchy mesh material, and its most immediately obvious feature is the Tron-like circuit traces embedded in the fabric. Essentially, the traces inside the glove act as electronic circuits, called Touch Points. Players can close a circuit by making contact between a touch point and one of three grounding spots — two on the thumb, and one planted across the palm. The first four fingers have five touch points, and the pinky finger has two. A magnetically-connected USB dongle attaches the glove to a Windows PC. Each Touch Point can be programmed to perform a command (or set of commands), giving gamers the ability to program as many as thirty so-called Touch Point Actions for a given game. And while the glove is being targeted to gamers, there’s no reason you couldn’t set up a profile to use it with, say, your favorite graphics application. The gamers demonstrating the Peregrine showed me how the speed of entering commands changes the nature of their real-time strategy gaming. Not only could the players enter commands more quickly, but they were more comfortable doing so, because they didn’t have to sit hunched over a keyboard. With the Peregrine in the left hand and the mouse in the right, it looks like it’ll be a lot easier to dominate the battlefield–real or virtual. It does not require a Windows PC. It is even happier on a Mac and LOVES Linux.